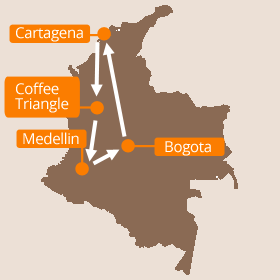 This two-week tour of Colombia has you exploring all the highlights of this fantastic country. Enjoy the culture and atmosphere of lively cities like Bogota and Medellin, kick back on a traditional hacienda in the gorgeous Coffee Region, and explore the tropical beaches and colonial history of picturesque Cartagena. "We particularly enjoyed travelling in Peru and Bolivia: the friendly people, the colour and vibrancy." We will meet you at the airport in Colombia's vibrant capital of Bogota and take you to your hotel in the city's metropolitan north side. After you’ve checked in why not take a stroll to one of the area's many restaurants and bars where you can enjoy your first taste of Colombian food... or maybe just the rum! If you’d like to make sure you’re absolutely, thoroughly relaxed, why not take a day trip out to the gorgeous Rosario Islands? Or even stay overnight to make the most of it? If you'd like to take in some of the highlights of Colombia, including the amazing Lost City (Ciudad Perdida) which is high in the Colombian cloud forest, but you'd also like to include a trip to Machu Picchu... then this is the itinerary for you! The standard price for our Colombia Highlights trip is £1850 per person, which is based on two sharing a double or twin room in our standard hotels.